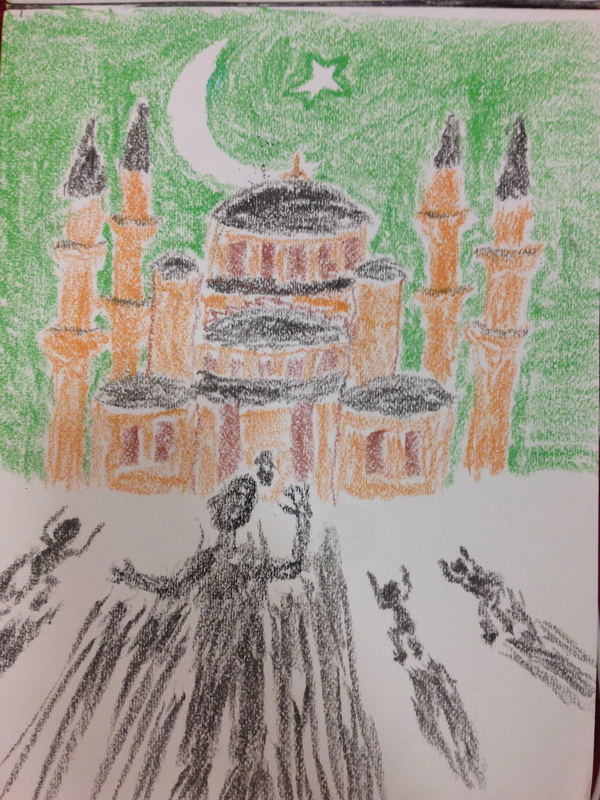 This image, drawn with chalk pastels, is a response to Esposito’s article, “Islam and Democracy.” In the article, Esposito goes through the history of how Islam and politics have been endemically intertwined in Pakistan since the country’s founding. As he explains, since Pakistan was founded as a home for Muslims, the country has struggled with its identity as an Islamic state, what that means in terms of the relation of Church and State, and furthermore what and under whose authority are the official, state-sanctioned practices of the faith. Thus, in the ensuing political debate about the nation should be organized and what Islam’s exact role was within it, Islam became more or less a political tool used by those in power – or at least those vying for power – in order control the masses and garner support for their party or faction. One prime example of this lies with Zia ul-Haq, the general who staged a coup in 1977 and controlled Pakistan by martial law for years, all in the name of Islam – By using Islam as a political weapon and integrating it into every fabric of the country, he was able to keep power. 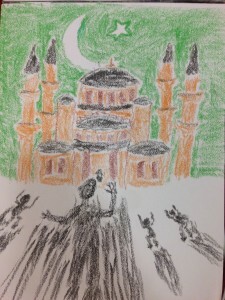 This politicization of Islam is reflected in the drawing, as a great mosque with a backdrop of the Pakistani flag, representing state power through the use of Islam as a political tool, is eclipsing the citizens in the forefront, as the state, through Islam, prevents non-Islamic discourse about the government and controls the people through their faith.